The L-arabinose operon, also called ara operon, encodes enzymes needed for the catabolism of arabinose to xylulose 5-phosphate. The structural gene, which encodes arabinose breakdown enzymes, is araBAD. The ara operon is regulated by the AraC protein. When arabinose is present, arabinose binds AraC and prevents it from interacting. operon: A unit of genetic material that functions in a coordinated manner by means of an operator, a promoter, and structural genes that are transcribed together. L-arabinose: Arabinose is an aldopentose – a monosaccharide containing five carbon atoms, and including an aldehyde (CHO) functional group. catabolism: Destructive metabolism, usually includes the release of energy and breakdown of materials. The L-arabinose operon, also called ara operon, is a gene sequence encoding enzymes needed for the catabolism of arabinose to xylulose 5-phosphate, an intermediate of the pentose phosphate pathway. It has both positive and negative regulation. The operon is found in Escherichia coli (E. coli). It has been a focus for research in molecular biology since 1970, and has been investigated extensively at its genetic, biochemical, physiological, and biophysical levels. The structural gene, which encodes arabinose breakdown enzymes, is araBAD. The regulator gene is araC. The genes, araBAD and araC, are transcribed in opposite directions. The operators are araI and araO2. The operators lie between the AraC. AraI lies between the structural genes and the operator. The araI1 and araI2 are DNA -binding sites that, when occupied by AraC, induce expression. The ara operon is regulated by the AraC protein. If arabinose is absent, the dimer AraC protein represses the structural gene by binding to araI1 and araO2 and the DNA forms a loop, which prevents RNA polymerase from binding to the promoter of the ara operon, thereby blocking transcription. When arabinose is present, arabinose binds AraC and prevents it from interacting. This breaks the DNA loop. The two AraC-arabinose complexes bind to the araI site which promotes transcription. When arabinose is present, AraC acts as an activator and it builds a complex: AraC + arabinose. 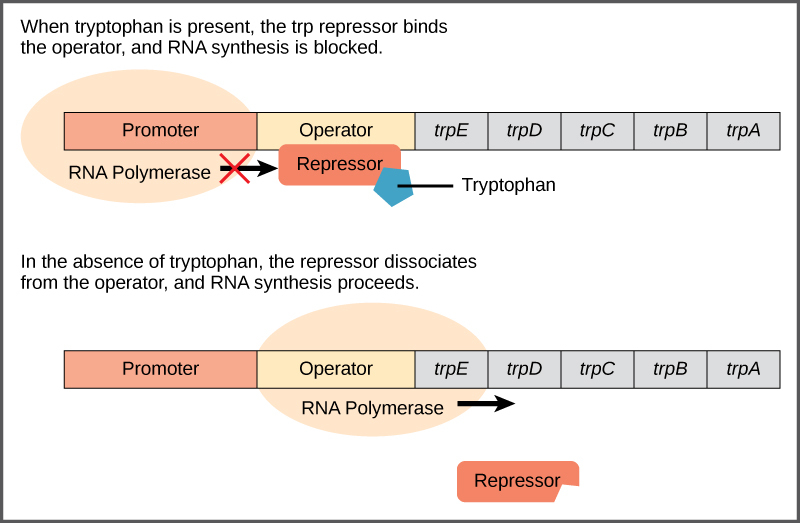 This complex is needed for RNA polymerase to bind to the promoter and transcribe the araoperon. Also for activation, the binding of another structure to araI is needed: CRP (formerly known as CAP) + cyclic AMP. Thus the activation depends on the presence of arabinose and cAMP.